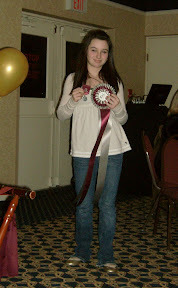 The American Saddlebred Horse Association of Ohio hosted its annual High Point Award banquet on 1/19/08, which included the Ohio Academy Riders Tournament Results. Although not specific to Morgan horses, many young riders that participate in Morgan horse shows begin their riding careers in Academy programs. The American Saddlebred Horse Association Academy Awards program encourages and recognizes juveniles and adults participating in academy classes at horse shows throughout the country. Academy classes create an opportunity for beginning saddle seat riders to develop and fine-tune their horsemanship skills, sportsmanship, and appreciation for the American Saddlebred. An Academy class is any class offered at a local tournament in which two or more stables are participating, or any class at an open show that is designated “academy.” Participants compete on horses designated as school horses, or horses that are regularly used in riding lesson program instruction. The Ohio Academy Riders participate in classes at several shows throughout Ohio. These shows included the Ohio Morgan Horse Association Spring Show, ASHAO Spring Show, COSCA Benefit, Brookfield Nationals, Brecksville Kwanis Charity Show, Buckeye Horse Park Show, ASHAO Fall Show, Delaware Twin Rivers Show, and Hartland Classic. Points for each class placing were awarded to the rider, tabulated at the end of the Tournament season, and High Point Awards were given. While there were no Gold Medal winners in 2008 (minimum of 75 points) several riders received Silver Medals (minimum of 50 points), Bronze Medals (minimum of 25 pts) and Participant Awards (under 25 points). The Silver Medal winners were: Carly Brayton (50 pts) with The Riding Academy at Memory Lane (Kelli Dreher, instructor); Coco Gerard (53 pts) with The Riding Academy at Memory Lane (Kelli Dreher, instructor); Jennifer Laughlann (68 pts) Holly Fisher, instructor; Morgan Palmer (59 pts) with The Riding Academy at Memory Lane (Kelli Dreher, instructor); Jackie Tighe (51 pts) with The Riding Academy at Memory Lane (Kelli Dreher, instructor); Monica Tolliver (64 pts) with The Riding Academy at Memory Lane (Kelli Dreher, instructor). The Bronze Medal winners were: Rachel Antarvari (31 pts) with Vickie Spoonster School of Equitation (Christine Spoonster, instructor); Sarah Charbat (47 pts) with JAM Stables (Jennifer Gorsuch, instructor); Susie Everiss (29 pts) with The Riding Academy at Memory Lane (Kelli Dreher, instructor); Katie Fillinger (25 pts) with The Riding Academy at Memory Lane (Kelli Dreher, instructor); Kasey McGee (37 pts) with The Riding Academy at Memory Lane (Kelli Dreher, instructor); Cassie Napier (47 pts) with The Riding Academy at Memory Lane (Kelli Dreher, instructor); Samantha Reed (46 pts) with Wheeler Stables (Eileen Wheeler, instructor); Erin Wilber (48 points) with The Riding Academy at Memory Lane (Kelli Dreher, instructor). Participant Awards went to: Hannah Dusek (9 pts) with The Riding Academy at Memory Lane (Kelli Dreher, instructor); Allison Fogelsong (4 pts) with Wheeler Stables (Eileen Wheeler, instructor); Kari Ingraham (0 pts) with The Riding Academy at Memory Lane (Kelli Dreher, instructor); Brittany O’Leyar (0 pts) with The Riding Academy at Memory Lane (Kelli Dreher, instructor); Brianne Radulovich (10 pts) with The Riding Academy at Memory Lane Farm (Kelli Dreher, instructor); Madison Schmidt (6 pts) with The Riding Academy at Memory Lane (Kelli Dreher, instructor). Congratulations to all the participants on a great Tournament season!